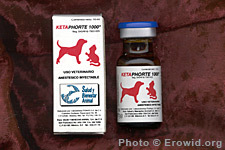 Ketamine is a dissociative psychedelic used medically as a veterinary and human anaesthetic. It is one of the few addictive psychedelics and is associated with researcher John Lilly. What substances are "K" and "G"? Is it really dangerous to combine ecstasy with ketamine? Which is worse for your body, ketamine or cocaine? Ketamine and neuroprotection. Clinical outlook.